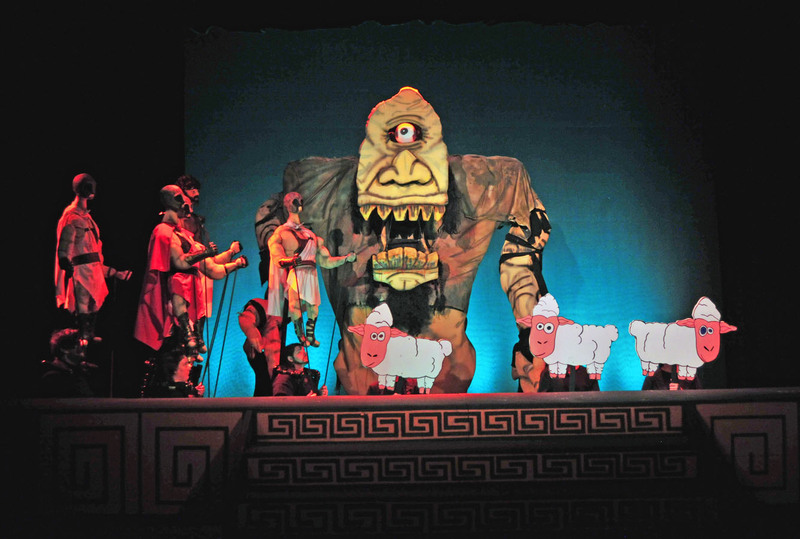 Northeast State Theatre’s 2013 productions, The Odyssey Abridged: A Puppet Tale of Epic Proportions and Treasure Island were hits with audiences and critics alike. Both productions have now earned a slew of nominations to the Region IV Kennedy Center American College Theatre Festival (KCACTF) in February recognizing the best theatre work of colleges in the Southeast. 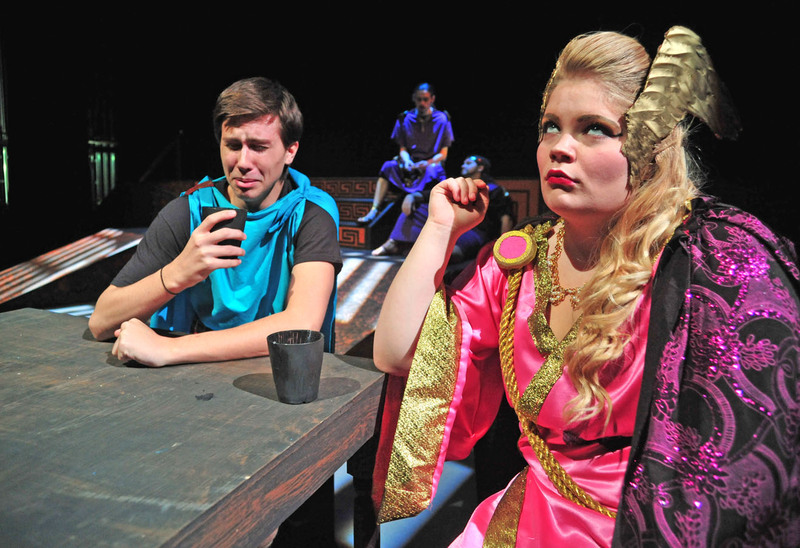 “The Odyssey was a pretty complicated show to run for students but they exceeded my expectations completely,” said Brad McKenzie, adjunct faculty and technical director of Northeast State Theatre (NST). Will Lambert’s lighting propelled the play’s adventure. McKenzie directed and wrote the stage adaptation for The Odyssey and received a Faculty Directing nomination. The play was the first NST production with all technical aspects performed by theatre students. All the nominees will travel to the Region IV festival held Feb. 4 to 8 at Hollins University in Roanoke, Va.
Kevin Carrier earned a nomination in Stage Management for his Herculean task of coordinating The Odyssey production. With hundreds of stage cues, fight scenes, a cast of human actors and puppet characters, Carrier orchestrated play movements from opening curtain to final bow. Polyphemus menaces Odysseus and his men. Will Lambert earned two nominations for Lighting Design with his work on NST’s spring production of Treasure Island and The Odyssey. Lambert returns to KCACTF competition after being nominated last fall for a Weiss Lighting Design award. Richard Curtis earned his fourth KCACTF nomination in three years as Puppet Designer for the The Odyssey. Curtis put together the character puppets and designed the puppeteers’ harnesses and hand sticks used to manipulate each puppet. He also built the gigantic Cyclops character that menaced Odysseus and the Lotus Eaters and Singing Sirens. The KCACTF Regional Festival gives each nominee display space to exhibit his or her work. Judges review the work as it fits into the overall production. Lambert and Curtis explained that all their work from the earliest schematic designs to the final cue lists would be included in the competition exhibit. 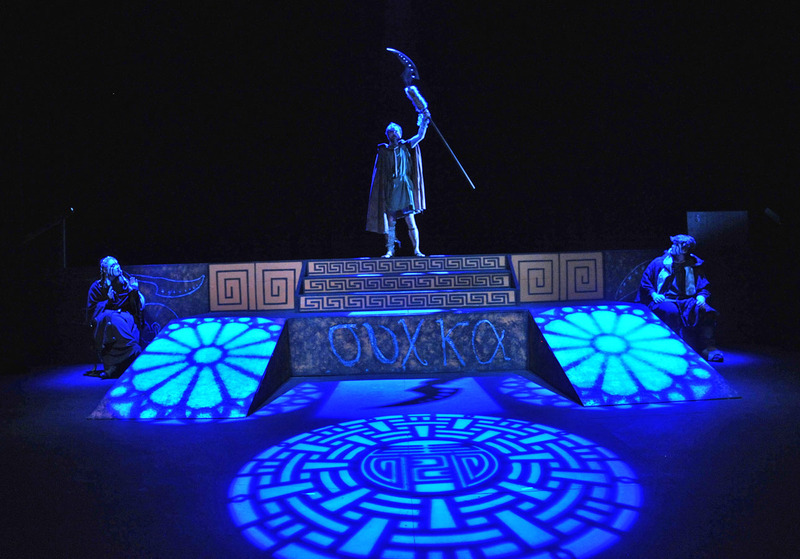 “You want to set it up like a judge can simply walk up, look at your display and understand what you were trying to do without you having to say a word,” said Curtis, who won a regional KCACTF award for his designs on Oedipus Rex. Telemachus (Austin Sparks) inspires the disdain of Athena (Hannah Duncan). Hannah Duncan and Michelle Goodwin earned Irene Ryan acting nominations for The Odyssey. Duncan played Greek goddess Athena. Goodwin portrayed Eumaeus and also served as assistant sound designer. Richard Jackson also picked up an Irene Ryan acting nomination for his work in Treasure Island. All three acting nominees will perform in dramatic scenes at the festival. Actors are judged with winners advancing into new rounds with longer scenes and more stringent critics. Penelope (Jessica Learoyd) welcomes home Odysseus (Michael Gillis). A proctor from Region IV attended performances of Treasure Island and The Odyssey to judge both productions. The play’s quality was graded and then considered for nominations to the regional competition. McKenzie noted the judges said the productions “gave them hope for theater studies” at colleges and universities in general. A seasonal Christmas concert with holiday treats and tons of good cheer proved to be a big hit Saturday night at the Kingsport Center for Higher Education (KCHE). 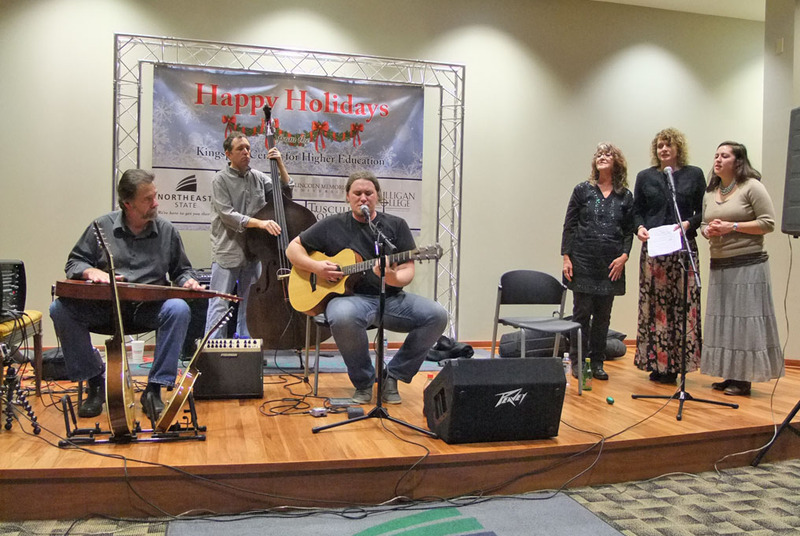 Northeast State’s Cultural Activities Committee sponsored rising local favorites Wise Old River and The Rose Sisters to play the first-ever Acoustic Christmas concert at KCHE. Wise Old River and The Rose Sisters perform at KCHE. The Rose Sisters opened the show with their elegant blend of Appalachian and Western swing music. Karla Diller and Jamie Collins are best friends, not sisters, but their superb harmonies and lyrics bind them as musical blood kin. Diller and Collins are multi-talented musicians and vocalists performed original songs for the audience and joined Wise Old River on stage for a few songs as well. Wise Old River blends a variety of influences and instruments that combine tradition with originality. The group features vocalist/guitarist Jamen Denton, Jim Denton on acoustic steel guitar, and the bouzouki. Jeanne Denton provides well-crafted harmony vocals and occasional percussion with bassist Stephen Marshall rounding out the group. The “eclectic-Americana” sound of Wise Old River has made them favorites at Northeast State events during the past year. The Rose Sisters and Wise Old River continue to grow in popularity around the region as “must-see” performers. The show’s price of admission was a toy for a needy child. Both bands played Christmas favorites with lead singer James Denton singing a beautiful acoustic version of “Silent Night” and his own original song “Christ Was Born on Christmas.” Wise Old River also played holiday classics at the tree lighting ceremony in downtown Kingsport earlier in the evening. Northeast State’s Students in Action sponsored a toy drive for the show with patrons brought a toy for distribution to needy children during the Christmas season. 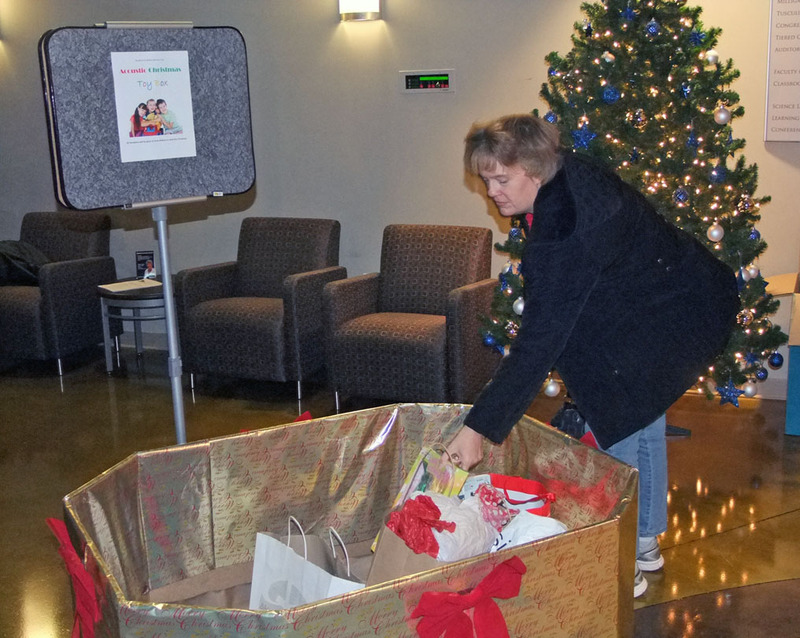 Patrons generously donated toys for needy children. All of the Commission institutions at the KCHE participated in the event. Milligan College and Northeast State provided hot drinks and cookies. Tusculum College’s professional photographer was present to take free holiday photos of the concert patrons and the University of Tennessee and Lincoln Memorial University gave away free goodies. 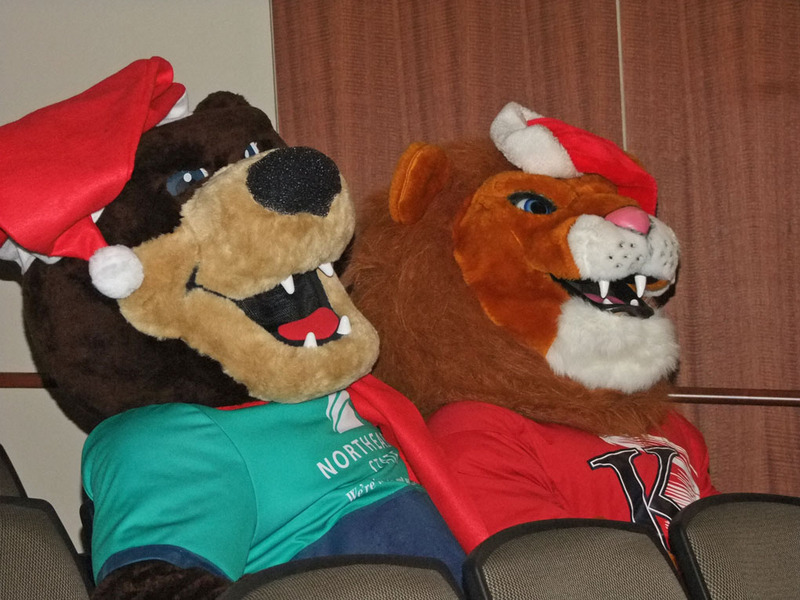 King University’s Twister, the Lion, along with Northeast State’s JP, the Bear, were also on hand to spread the holiday spirit. J.P. and Twister take in the show. KCHE hosts courses from all six member institutions. Enrollment at KCHE exceeded 2,000 students for the fall semester. Barnett said these member institutions of the Kingsport Higher Education Commission have cooperated well toward both academic achievement and social advancement of the KCHE as a cornerstone of the city’s Academic Village. She added that arts lovers should mark the KCHE Auditorium as a new venue to see a variety of cultural events in downtown. One of the most beloved television shows in history, The Andy Griffith Show featured a cast of memorable characters. 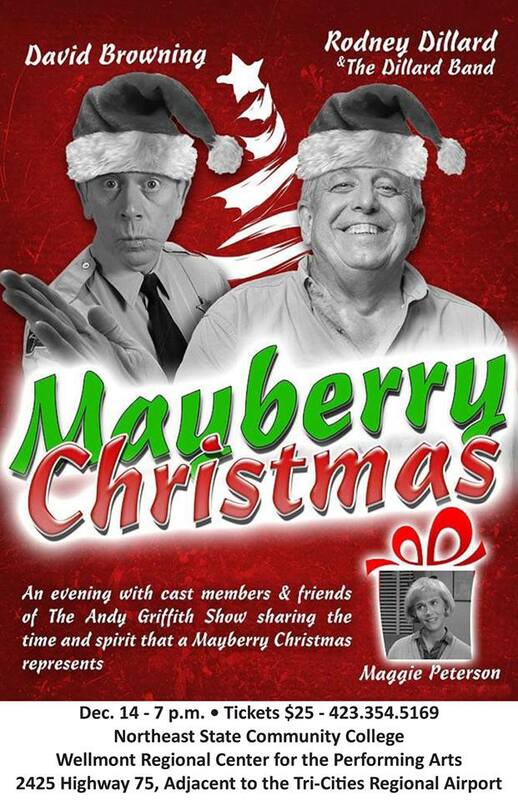 Northeast State invites you to return to Mayberry to remember, “nip it in the bud!” and visiting with the Darlings at “Mayberry Christmas” this Saturday, Dec. 14 at 7 p.m. in the Wellmont Regional Center for Performing Arts Theatre on the College’s main campus at Blountville. Buy tickets online now to “Mayberry Christmas” at www.NortheastState.edu or reserve tickets by calling the Northeast State Box Office at 423.354.5169. Join your friends and family for a walk down memory lane to Mayberry. The evening features Rodney Dillard and the Dillard band, actress Maggie Peterson who portrayed Charlene Darling, and the Mayberry Deputy spreading holiday tidings and cheer. The doors will open to the WRCPA Theater at 6 p.m. to allow patrons to get seated and enjoy some pre-show entertainment. Tickets are $25. For more information, contact the Northeast State Box Office at 354.5169 or visit www.NortheastState.edu. In a rapidly changing industry landscape, health care professionals are asked to maximize their skills and take on more responsibility for patient care. A new federal grant gives Northeast State’s division of Nursing a new academic option providing licensed practical nurses a pathway to become registered nurses in three semesters. The RxTN option is funded through the U.S. Department of Labor’s Trade Adjustment Assistance Community College and Career Training grant awarded in September of 2012. The program’s prior learning assessment (PLA) gives academic credit to LPNs a current LPN license. The PLA credit allows these students to complete the program in three semesters rather than five. 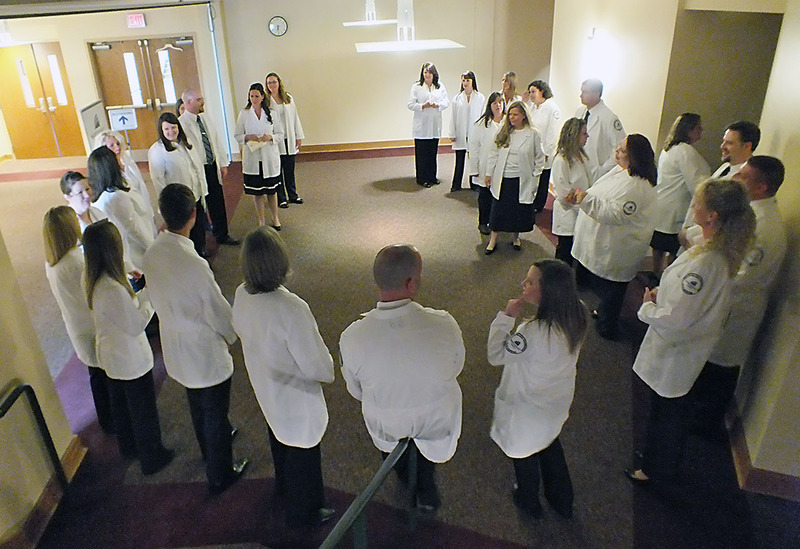 The program’s participants earn an applied associate of science degree in Nursing. Nurses are being asked to do much more in health care. Dr. Melessia Webb, dean of Nursing at Northeast State, said the first LPN class will accept 25 applicants. The class will move together as a cohort through the three semesters. Nursing students study a variety of care specialties including but not limited to obstetrics-gynecology, mental health, and geriatrics. Students also study comprehensive care management and leadership. Webb explained that the area is still experiencing a nursing shortage with a continued need for additional registered nurses. She said the LPNs who complete the option and become licensed registered nurses would have a more extensive scope of practice,thus leading to more career options. LPN to RN students will have access to all current Nursing program resources. With the academic and clinical demands of the project, the grant stipulated that the RxTN program place a big emphasis on retention and graduation of participating students. According to its brief, the RxTN Program provides special advisement and access to completion coaching for participating students. That duty falls to Nursing faculty member Tammy Pennington who will direct coaching, advisement, and support for applicants accepted into the LPN to RN option. Webb noted that industry projections suggested there would be 1.2 million job openings for registered nurses by 2020. Of that number, 470,000 would be filled by registered nurses with associate degrees. 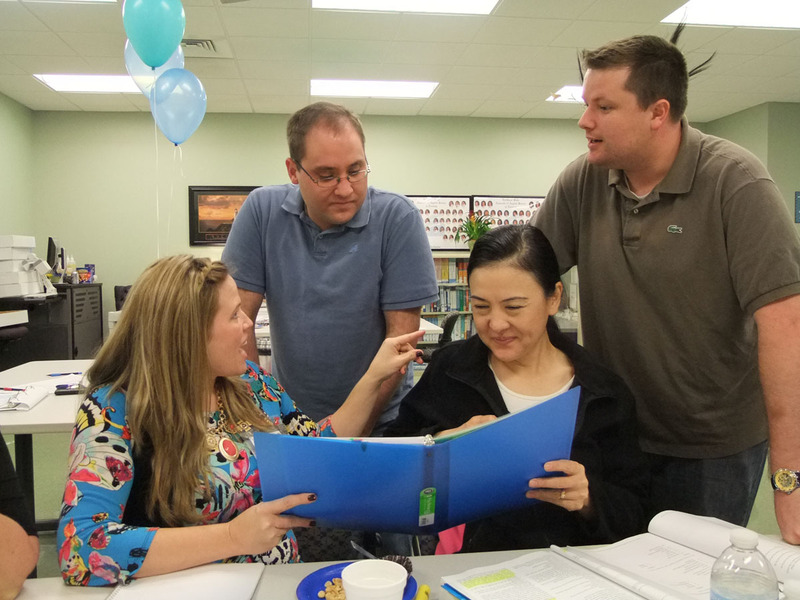 Northeast Nursing graduates who pass the NCLEX exam enter the workforce as registered nurses. According to the Alliance for Business & Training (AB&T), current job openings for registered nurses are keeping pace with nursing school graduates entering the career ranks. The demand for license practical nurses has demonstrated a drop-off with only one opening for every five LPN graduates entering the workforce, according to AB&T data. The RxTN Program created a consortium of the Tennessee Board of Regents’ 13 community colleges and 27 technology centers that received funding. Nursing faculty members expect a significant number of non-traditional students to apply for the LPN-to-RN program. To apply for the LPN-to-RN program, visit www.northeaststate.edu/nursing web page to print an application for the program. For questions about the program, email lrjones@northeaststate.edu or trpennington@northeaststate.edu. They are back and better than ever. 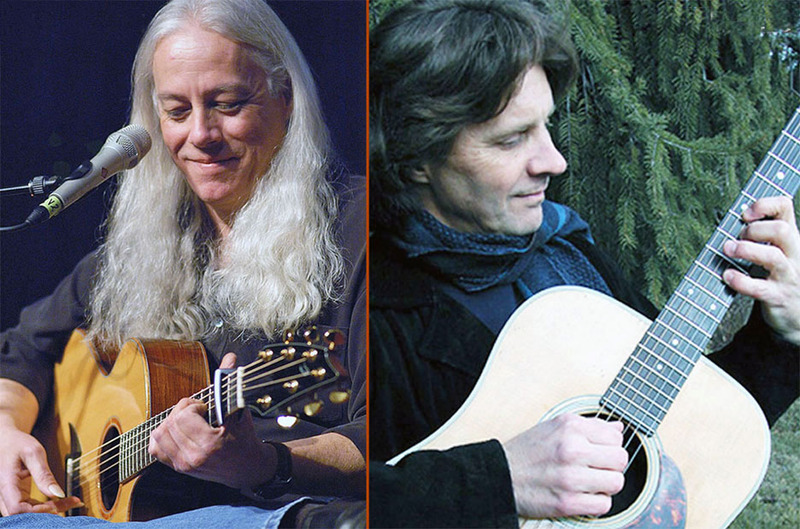 Guitar legends Ed Gerhard and Bill Mize return to Northeast State Community College for a free Christmas concert on Thursday, Dec. 12 at 7 p.m. in the Wellmont Regional Center for Performing Arts Theatre on the College’s main campus at Blountville. The duo will perform instrumental Christmas and holiday favorites as well as selected original works. Gerhard is a multiple Grammy Award winner. His guitar work can be heard on recordings by Arlo Guthrie and Jorma Kaukonen and in the Ken Burns film Mark Twain. He has released two critically praised holiday albums, Christmas and On a Cold Winter’s Night. After several restarts, remixes, multiple mastering sessions, his newest album There and Gone, was recently released. The album features 14 tracks of Gerhard’s masterful style. Mize is also a Grammy-winning guitarist and renowned instrumentalist. His music was recently selected for two documentary films: The Appalachian Trail: Past, Present and Future by Farrar & Ketelle Productions, Common Cents: Philanthropy Roundtables by YourStoryFilms. He has released albums Sugarlands, Tender Explorations, Coastin’, Joyful Noise, and The Angel’s Share that was called one of the “essential acoustic albums” to own by Acoustic Guitar Magazine. Doors open at 6:30 p.m. Admission is free and open to the public. For more information, visit billmize.com and www.virturerecords.com. For additional information, contact 423.279.7669.